We recommend checking out our discussion threads on the SoundToys FilterFreak - Virtual Resonant Analog FILTERFREAKTDM, which address similar problems with connecting and setting up Virtual Processor Plug-Ins SoundToys. The user manual for the SoundToys FilterFreak - Virtual Resonant Analog FILTERFREAKTDM provides necessary instructions for the proper use of the product Pro Audio - Computer Audio - Virtual Processor Plug-Ins. 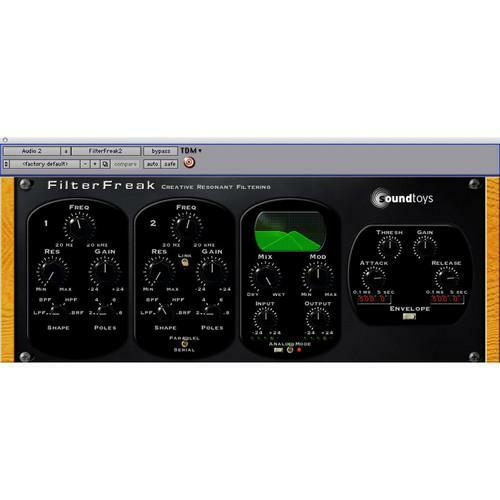 FilterFreak from Sound Toys is a virtual analog filter for Avid Pro Tools HD systems, but also includes Audio Units and VST native format versions. Designed to sound "fat" and "warm", the plug-in can emulate envelope followers like the Mutron, perform classic synthesizer style reshaping with the ADSR, and deliver big resonant LFO sweeps like the Sherman Filterbank, as well as the classic sound of the old Morley WahWah pedals. It even features two flavors of the old Sci-Fi sample and hold sound. In addition to emulating the classics, the plug-in adds software functionality, such as MIDI sync and a large preset library. The Rhythm Mode allows the user to create custom patterns that lock to MIDI. Grab the Groove knob and use swing or shuffle to drop it in the pocket. Flip the MIDI switch, select 1/4 notes and a sine wave, and create instant auto wah. Emulations of different filter types can be selected to get a wide range of classic sounds. The included FilterFreak2 allows for running two analog filters in series or parallel. Each filter can function in low-pass, high-pass, band-pass, or band-reject mode, and can be setup as 2, 4, 6, or 8 pole filters. If you own a SoundToys virtual processor plug-ins and have a user manual in electronic form, you can upload it to this website using the link on the right side of the screen. The user manual for the SoundToys FilterFreak - Virtual Resonant Analog FILTERFREAKTDM can be downloaded in .pdf format if it did not come with your new virtual processor plug-ins, although the seller is required to supply one. It is also quite common that customers throw out the user manual with the box, or put the CD away somewhere and then can’t find it. That’s why we and other SoundToys users keep a unique electronic library for SoundToys virtual processor plug-inss, where you can use our link to download the user manual for the SoundToys FilterFreak - Virtual Resonant Analog FILTERFREAKTDM. The user manual lists all of the functions of the SoundToys FilterFreak - Virtual Resonant Analog FILTERFREAKTDM, all the basic and advanced features and tells you how to use the virtual processor plug-ins. The manual also provides troubleshooting for common problems. Even greater detail is provided by the service manual, which is not typically shipped with the product, but which can often be downloaded from SoundToys service. If you want to help expand our database, you can upload a link to this website to download a user manual or service manual, ideally in .pdf format. These pages are created by you – users of the SoundToys FilterFreak - Virtual Resonant Analog FILTERFREAKTDM. User manuals are also available on the SoundToys website under Pro Audio - Computer Audio - Virtual Processor Plug-Ins.